When Matt and I bought the farm months ago we both knew somehow we wanted to share it with people in a really intimate way. Starting a lavender farm is beautiful, smells awesome & very romantic, however, when we open the farm for events and to the public it doesn't seem that "intimate." On a cold, cold winter night this past winter, The Gather Series was born. 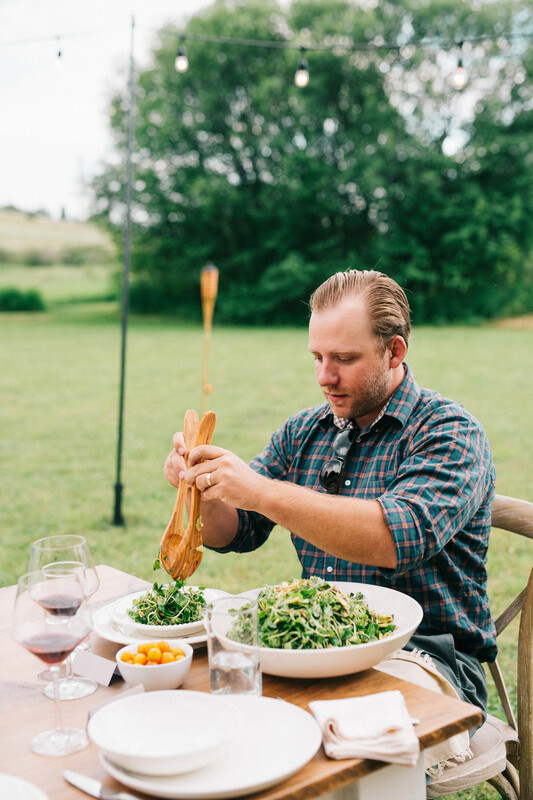 It's always been a dream of mine to host outdoor dinner parties, and The Gather Series seemed like the perfect way to blend together our favorite things; good people, good food, wine & the community-driven spirit of Northern Michigan. We wanted to create something small and special that brought strangers around the table, had zero pressure & was a relaxed way to meet farmers, creators, artisans & business owners that you may have never met otherwise. On Tuesday this week we had our first ever dinner. The Gather Series was born on the first official day of Summer 2016 and I could not have dreamed up something to be any better than this. We are already reserving seats for July, August and September's events. If you're interested in one, drop us a line. I can't say enough about Taylor, our team leader this summer who executed this event flawlessly. Having her a part of the tribe this summer is a dream come true for us. Each month when The Gather Series wraps we will give a full run down of the delicious, beautiful, unique magic that happened. Below is our first dinner in full. Enjoy, and we'll see you at the table. After wine was poured, everyone found their seats at the dinner for a delicious experience start to finish. Sue Kurta from Boss Mouse Cheese provided over-the-top cheese platters that included tons of options of her delicious cheese that she makes by hand at her Kingsley farm. Next up, Brian Bates & Anne Morningstar from Bear Creek Organic Farm whipped up a delicious microgreens salad with a honey vinaigrette. Brian & Anne harvest their greens by hand & used their own honey in the salad. Finally, Stephanie Wiitala from Sunrise 2 Sunset Events provided a summer roasted pork loin, baby zucchini, rhubarb chutney & cornbread muffins to round out an evening full of flavor. Stephanie had 'gathered' her ingredients that morning from her yard & the farmers market to create a delicious main course that was both fresh & bright. The night would not have been the same if it wasn't for our additional vendors/friends. Kelly from Serradella Vintage provided our awesome bar, chairs & some vases to adorn the tables. Catherine Holden from Holden Photographs snapped these beautiful images. And of course, florals provided by yours truly.